Just now am I realizing that this is actually only my third post in Worcester. We've previously seen the Compare Foods, which is now a Gala Foods as I mentioned in passing yesterday, and the America's Food Basket. Worcester is the city I now call home, but if you love the NY/NJ area, don't worry! There's lots more of that material to cover, and I'll throw in a little Worcester every once in a while. 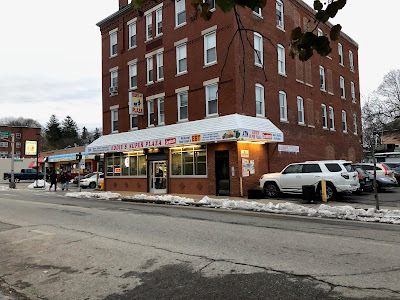 Coming back from a Price Chopper a week ago (which we will tour, someday...), I made a left turn one block too soon and hit three grocery stores I hadn't seen before. Eddie's Super Plaza is one of them. 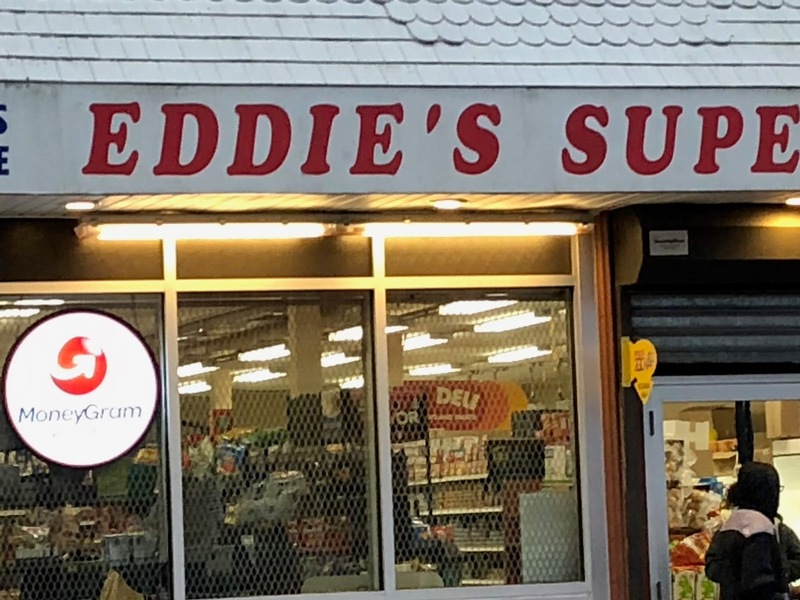 Eddie's is a small grocery store with a butcher and deli, produce, and a very small selection of dairy and frozen. There are a few aisles of packaged groceries as well; the storebrand is Krasdale. Pretty nondescript from the outside. I wasn't planning to go in because I was just passing by and I was pretty sure there was nothing worth going in for: I already knew they used the Krasdale brand, and I was almost positive they didn't have a circular (which I collect, by the way, and then file alphabetically by store name and then chronologically). But as I took this picture, something caught my eye. At first I was pretty sure I was just imagining it, but I quickly realized my eyes weren't playing tricks on me. 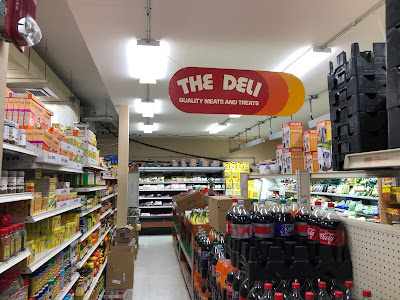 I patiently waited for the "walk" sign (because you can complain about NJ drivers all you want, but Worcester drivers don't stop for pedestrians), then headed straight for the deli department. Can you see what I'm talking about in the above photo? Yes...that is an A&P sunrise-logo deli sign! I snapped this picture in case it became clear I couldn't take a picture inside because the store was very busy, very small, and well-staffed. But I was able to get a picture! (The first aisle is kind of divided with this makeshift shelving, which hid me from the deli clerk, who was looking out into the store and doing nothing.) This is awesome (although Eddie Super Plaza, as a store, is not)! It's in absolutely pristine condition. Unfortunately, I don't remember what exactly was on the other side. I'm pretty sure the colors were reversed (so the big red panel was on the right, then the smaller orange and yellow panels), but I don't know if the text was on the other side as well. This turned a relatively uneventful gray Sunday into an exciting discovery! According to the A&P Preservation blogger, this style of sign was most likely introduced with the "We Watch Our P's and Q's" campaign in 1982; however, the sunrise logo was introduced in 1976, so it could be as old as that. A&P Preservation also informed me that this style of sign was mostly installed in centennial model A&Ps during their renovations. 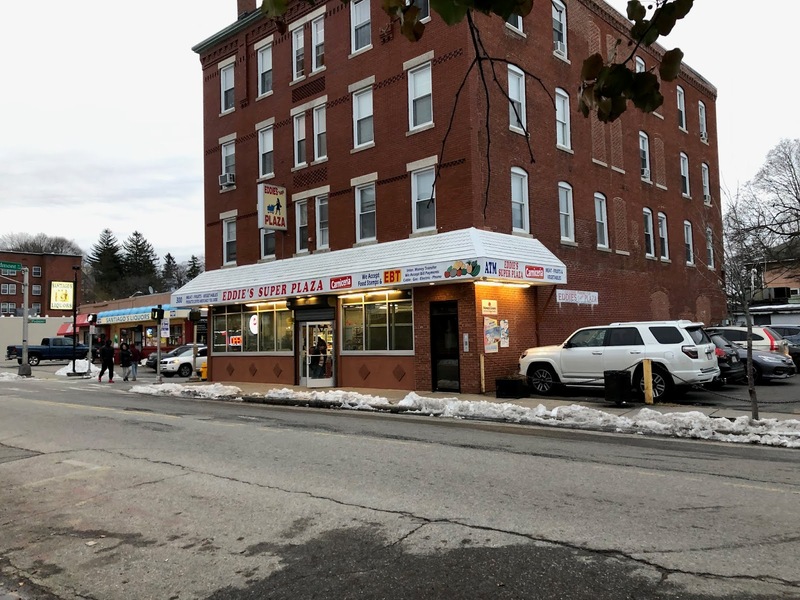 There was an A&P centennial model in Worcester, at 700 Southbridge St. That store, along with many others, is coming to The Market Report but very far in the future. 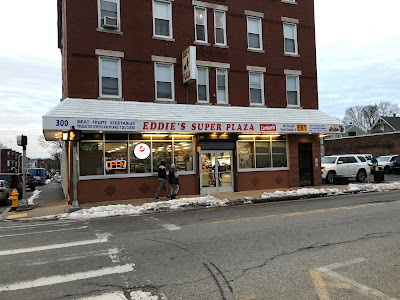 If you want to visit for yourself, Eddie's Super Plaza is at 300 Pleasant St in Worcester. UPDATE: A revisit to the store reveals that the other side is hollow. A&P Preservation informs us that these signs were typically mounted directly to the wall, rather than hanging as it is here. Despite my insistence that I saw the other side of this sign, I was wrong. Thanks, A&P Preservation! Back to Brooklyn bright and early tomorrow morning! Thanks! Yes, I figured this should go up right away. I wish! I'm in Worcester for college -- so the "new place" is a dorm, and there ain't exactly a whole lot of room for file cabinets. Don't worry, I've made room for my circulars though! Ah, okay! Yep, I totally understand about dorm rooms - been there, done that :P I'm in an apartment on my college campus these days - the best of both worlds! You're very welcome for the information! Glad I could help. The Market Report Introduces Online Store! Happy Birthday to The Market Report! Video of the Month: The Food Hierarchy!